The big picture: Want a big TV but don't want it to ruin your room's aesthetic? LG's 65-inch rollable TV will launch this year and the engineering involved to bring it to market is incredible. TVs that roll up into their base when not in use have been teased at CES for a few years now, but it's finally time for one to hit the market. LG announced the product a while back and it is now on display for everyone to admire at CES this year. The 65" 4K TV, called the LG Signature OLED TV R, will go on sale in the Spring for an as yet undisclosed price. Given the R&D required to bring this to market, we expect it to be in the 5-figures. The backing of the TV has numerous slats which allow it to roll around an internal cylinder with the whole process taking around 10 seconds. Since this is the first of its type, it's hard to tell how robust this window blind-style mechanism is. 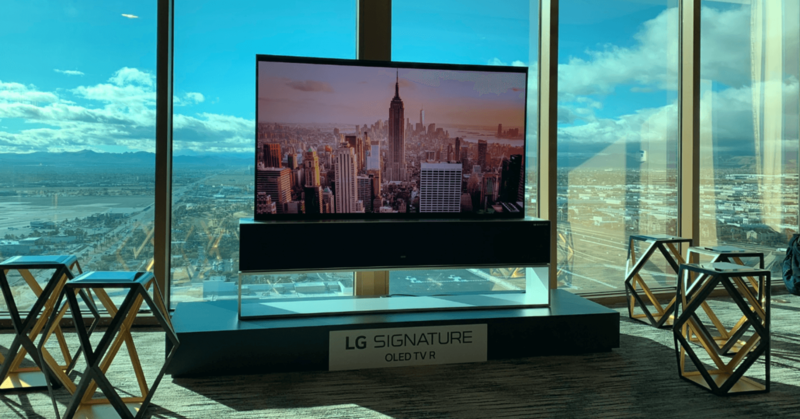 LG has tested it for 50,000 cycles though, which should outlast the TV meaning it won't be an issue. Since the main selling point of this model is that it disappears when you don't want to see it, you may expect it to sacrifice on image quality. LG claims it provides the same image quality as their other non-rollable OLED models. Until we can get a direct comparison though, we'll just have to take their word for it. The base of the unit is where all the connectivity is stored. LG has moved to HDMI 2.1 and also included support for Amazon Alexa, Apple AirPlay 2, and Google Assistant. There is also 100W speaker in the base, but if you're spending this much on a TV, you'll certainly want some dedicated speakers.